There are many Alien Theories that are floating around the world, from current days to prehistoric possibilities. While skimming through all of the supposed theories and evidence, I found one that caught my attention. Over 6,000 years ago, well before the infamous Annunaki Alien Tribe of the African Gold Mines, there was a small civilization that appears to of seen, or had encounters with, some unknown alien like creatures. 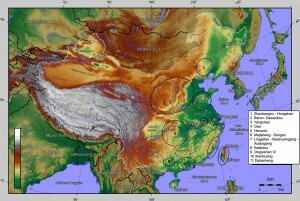 The Hongshan Culture is dated back from around 4500-2700 BC located in the northern part of China. It is believed that they originally developed in Mongolia but due to changes in climate migrated south into, what is now, China. The history of this civilization is just know being thoroughly studied and excavated. A Japanese Archaeologist originally discovered artifacts from the Hongshan Culture in 1908, for an unknown reason excavations didn’t begin until 1935. These extensive excavations are still going on to this day with the newest report from the site being in January 2015! Some of the first artifacts found have been carbon-dated back 6,500 years. 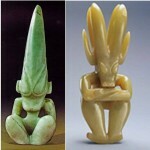 The most common artifacts that are being located are jade figurines of all sizes. Most often the jade artifacts seem to have an alien-looking form or the form of a humanoid animal. Their domed heads with elongated tear drop shaped eyes fit perfectly with descriptions of aliens throughout history and into the modern day. The shape of these magnificent figures is not the only thing that makes an alien influence seem probable. The Hongshan were the only Neolithic Culture to make statues of this shape and to make statues with amazing skill. Let me add, this civilization is considered a Stone Age culture. Most of the statues and figures that have been located appear to of been done with such sophisticated skill that carving marks are not even seen! Now, this may very well be possible today, but with such limited resources and even fewer specialized tools, how could they make such precise and exact works of art? Another important piece of information to consider is the fact that the Hongshan built one of the first pyramids. When thinking of pyramids most people imagine the massive pyramids of Egypt. Egypt was far from the first to develop these types of structures. Even when comparing the early Egyptian Pyramids to the Hongshan Pyramid there are similarities that just ring with advanced technically leading to the question of Extraterrestrial involvement! To look at the possible religious practices of the Hongshan also brings up other civilizations that are believed to have a connection to an Alien Race. The altar and Goddess Temple of the Hongshan is rather similar to that of the temples and altars of the Mayan and Aztec Civilizations! There are a wide range of questions when it comes to the Hongshan Culture and their history. How can a civilization be so advanced? How can they work with such precision? Where did they find the inspiration for these figures? Being such a forgotten civilization, how were their skills carried through for hundreds of years after they disappeared? As excavations and scientific study of the sites continues, hopefully some of these questions can be answered. Are we alone in the Universe? This question has intrigued me for years. As a child, I seemed to be on a mission to prove that we are not. Though decades have gone by and life steers you in many directions, usually away from “flights of fancy” as they are called. I still hold apart of my heart for the child within, that one day would love to see this one answer explained and verified publicly. My article is about such a man. Former Sergeant Clifford Stone felt a moral responsibility to serve the public by explaining the truth of his experiences. Skeptics have plagued his experiences with doubt. However, skeptics found that when Mr. Stone was asked for evidence he provided what he felt was appropriate and what he could legally obtain through the Freedom of Information Act to prove his experiences in the military. References and reports have been posted by Majestic Documentation website which alleges; The Phenomenon Unit was a unit in the military created in 1942 with the expressed interest into the study of UFOs. Recent information claims; Interplanetary Phenomena Research Unit began in 1943 under the command of General Douglas MacArthur. Clifford Stone is a former Army Sergeant, who served 22 years from 1968 to February 1st, 1990. Serving as a “Clerk Typist” on Military documentation, Mr. Stone served a much more interesting division in the military in recovery of Extraterrestrial Biological Entities as well as crafts. These experiences were documented in the EBE Guidebook which cataloged Fifty seven different types of EBEs. These experiences were gathered by means of UFO or “Object of Unknown Origin” crash retrievals, EBE visitations and interactions, and/or cooperation with some EBEs who were aware of fellow EBEs visiting earth. In an exclusive interview with Dr. Michael E. Salla, (Expopolitics Journal-dated July 20, 2005), Mr. Stone explains his experiences in his own words, very eloquently. He has also authored a book; UFOs are Real: (1997) in which Mr. Stone brings documents to public never before published, confirming his claims. Retired after serving his military career, Sergeant Stone felt compelled to publicize his work so that the public was no longer misinformed of situations and experiences that have happened all over the world. Skeptic Captain Randall, does not believe in the claims that Mr. Stone’s training was in Clerk Typist in order to cover his covert operations, yet Dr. Salla believes that if Sgt. Stone was truly a Clerk Typist then his knowledge of the covert operations; Moon Dust and Bluefly would not exist and could not be obtained through FOIA. Another claim in Dr. Salla’s defense of Sgt. Stone is that; Mr. Stone though wrote a book to publicize the information he had; his objective was not for material gain but to share knowledge without being in the public eye. My view maybe skewed in favor of Sergeant Stone, being a former member of the military and involved in FOIA requests at a point in my career. I find it would be difficult if not impossible to outright fabricate or manipulate said experiences. To those who find Mr. Stone’s experiences difficult to fathom or swallow; I urge you to investigate this subject further with the links I will be providing at the end of the article. My point is not to change your mind, but to open it to the possibilities there are more to this world then we are presently made aware. Your beliefs are up to you! 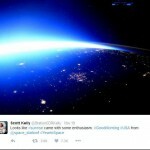 Recently, there have been images posted to social media from the International Space Station, ISS. These photos were taken by Astronaut Scott Kelly who has been at the Space Station for almost a year. Kelly is known for taking a large amount of wonderful photos and posting them to social media for the world to see. The images have now been shared so many times that they have made their rounds worldwide through different news outlets and all forms of social media. With the world a buzz about these astounding images and the unexplained object that they caught, I felt an article to go over what is known and what is being said might help some in their research. 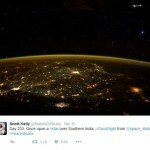 The photo was posted on November 15, 2015, Astronaut Kelly posted a photo to his Twitter account that was taken of Southern India at night from the Space Station. In this photo there is an object located in the top right corner of the photo that appears to be unexplained. On November 19, 2015 he also posted a photo to his Twitter account of the sun set beginning to rise up, and a very similar object also appears in the top right of the image. It didn’t take long for videos and blogs to come up state that Kelly is trying to drop hints that there are Aliens out there and that these two photos prove it. One alien researcher, Sonofmabarker, said the object “appears to be very large and constructed.” Other statements have also been made that the object is more than 80 feet long and at least 492 feet away from the ISS. According to NASA a High Definition Earth Viewing System was placed aboard the International Space Station in April of 2014. Some professionals in the field are saying that the image in the photos are a reflection from the window of the HDEV. 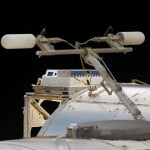 This HDEV was partly developed by students in the United States and is currently in experimental stages to see how well it can handle the radiation of space while in a temperature controlled housing. It will also help to develop better camera components that can withstand space better while providing clear and clean images. It is well known that, with all of the space travel done from earth, there is a good amount of space debris floating around. A NASA Administrator has openly said there is a good amount of debris in space and that little, to nothing, is being done to take care of it. NASA officials have recently warned that this space debris could cause problems in the future if it isn’t taken care of and can, or has, come close to the International Space Station at times. I have provided you with three summarizes of the theories currently going around about the amazing images taken by Astronaut Scott Kelly on the International Space Station. What do you believe this object to be? What research would need to be done to prove or disprove these theories? How would you go about using your due diligence to help solve this new mystery? The oldest known graves, here, dating from as early as the 1860s, are those of the Randall and Rowlett families. Finis Dudley Beauchamp (1825-1893), a Confederate veteran from Mississippi, donated the 3-acre site to the newly- formed Aurora Lodge No. 479, A.F. & A.M., in 1877. For many years, this community burial ground was known as Masonic Cemetery. Beauchamp, his wife Caroline (1829-1915), and others in their family. An epidemic which struck the village in 1891 added hundreds of graves to the plot. Called “Spotted Fever” by the settlers, the disease is now thought to be a form of meingitis. Located in Aurora Cemetery is the gravestone of the infant Nellie Burris (1891-1893) with its often-quoted epitaph: “As I was so soon done, I don’t know why I was begun.” This site is also well-known because of the legend that a spaceship crashed nearby in 1897 and the pilot, killed in the crash, was buried here. Struck by epidemic and crop failure and bypassed by the railroad, the original town of Aurora almost disappeared, but the cemetery remains in use with over 800 graves. Veterans of the Civil War, World Wars I and II, and the Korean and Vietnam conflicts are interred here. These are the words on the Historical Marker that is in the Cemetary in the sleepy little town of Aurora Tx. Aurora is on Hwy 114 in Wise County Texas. Although the population now is just 1400, back in the late 1800’s it was the largest town in Wise County with a population exceeding 5000. In the late 1890’s Aurora hit some hard times. The cotton crops were wiped out by a boll wevil infestation, then a fire claimed several buildings and lives on the west side of town. Shortly after this a spotted fever epidemic wiped out most of the population causing the town to be quarantined. After all of this the planned railroad that was supposed to come into to town got within 27 miles but never made it into town. Fast forward to April 17, 1897. In the early morning hours ,what is described as an alien craft crashed into the windmill over the well on the property of Judge James Spencer Proctor, destroying the windmill and his flower garden. There was a large explosion and debris flew everywhere over an area several acres wide.. The pilot of the alien aircraft was taken to a barn and attempted to be saved but died that day. According to the Fort Worth paper the alien pilot was given a Christian burial in the Aurora Cemetery at noon the next day. On April 19, 1897 the Dallas Morning News ran an article about the crash and about sightings in 21 different towns in North Texas between April 15 and April 19, 1897. The Proctor property was bought by the Oates family who have claimed nothing would grow there for years The Oates family also suffered from health problems including cysts and goiters supposedly from drinking the well water. Over the years, different groups have attempted to dig up the alien body but have been turned away by towns members. 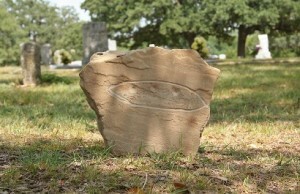 The headstone marker which was the only thing pointing out the grave disappeared in 1973. After this happened the cemetery board hired an attorney to fight researchers who wanted to exhume the body. The town had been wiped out by a spotted fever epidemic in 1888 and the officials did not want the bodies disturbed. Graves we not well marked at the time and there was fear that digging might happen in the wrong place and disturb the rest of citizens. There have been claims over the years that it was all a hoax. One person stated there was never a windmill on Judge Proctors property, however in 2008 a crew from a UFO television show investigated and dug up struts for a windmill around the well. There have also been reports of interviews with people who were alive at the time of the crash that stated government personnel appeared in town the day after the crash and took the wreckage away. Short of finding the gravesite and digging up the body, we will never know if there is actually an alien buried in Aurora TX or not. Truth or legend, it is and likely will always remain part of the history and claim to fame for this small Texas town. What do Inner Earth, Caves, Richard Shaver and Blue tinged humanoid beings have in common? In this case the answer is Cushman Arkansas. ot so unusual when you are talking about a cave network, people get lost or caught in landslides and collapses all the time. However there may be another reason for these disappearances beyond the normal spelunking accidents. In the 1940’s Richard Shaver wrote a series of articles for the science- fiction magazine Amazing Stories about two advanced races left behind by extraterrestrial forefathers, the Tero and the Dero. These beings , the Tero ( benevolent, friendly creatures) and the Dero (malicious, vile creatures with a penchant for consuming humans for dinner) were said to live in vast caverns under the Earth’s surface connected by thousands of miles of subterrainian tunnels spanning most of the country. 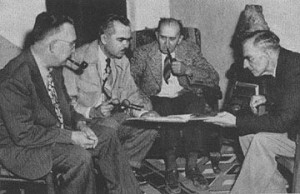 While most chalked the stories up to the wild ramblings of the twisted mind of Shaver, many gave some credence to the stories while others fervently believed them. George D. Wight a UFO buff and regular columnist for a UFO newsletter is one person who falls in the “some credence given” category. He also had an avid interest in cave exploring which he shared with the owner of the newsletter David L. and another columnist Charles A Marcoux( who was and avid believer in Richard Shaver’s stories). 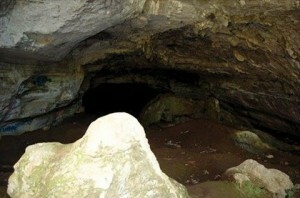 In 1966, Wight with a group of 11 others went down to Arkansas to explore Blowing Cave on a week long expedition. On their return, the members of the expedition claimed to have encountered the Tero of Shaver’s writing. They wrote to the once editor of Amazing Stories magazine with their claims. He never responded. The group made several more expeditions attempting to get proof so that others would believe them but were unable to. George Wight went back to the cave several months later to stay with the Tero. In 1967 he returned and asked David L to pass his journal to Charles Marcoux. It took until 1980 for David L to pass the journal on to Marcoux with whom he had lost touch over the years. The journal related that on the original expedition he had found a nearly hidden crevice halfway between the cave mouth and the lake inside the cave. He called his companions and they squeezed through the crevice. Once inside the crevice they were able to stand upright and found themselves in a long glass like tunnel. Soon they encountered blue skinned humans who told them they had allowed them to find the tunnels because they had instruments that had determined their intentions were good. They learned from their guides ( descendants of Noah who had escaped underground to avoid the great flood and found ancient technology along with the Teros) that the tunnels went on for hundreds of miles and connected underground cities that housed serpent like beings, Sasquatch type societies and the Tero. Shortly after passing his journal to David L., George Wight returned to live with the Tero and was never heard from again. 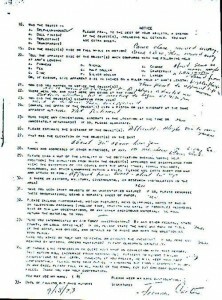 According to one of the other members of the expedition shortly after Wight returned to the Tero all trace of him started disappearing ( birth certificates, school records, bank and computer records) as if he never existed. Upon receiving the journal in 1980 from David L, Marcoux became obsessed and began planning another expedition to Blowing Cave. In 1983 he and his wife moved to Cushman, AR. There in November of 1983 while exploring the land around the cave he was attacked by a swarm of bees, had a heart attack and died instantly. Marcoux’s death ended any further efforts to go back to Blowing Cave in search of the Tero and other underearthers. 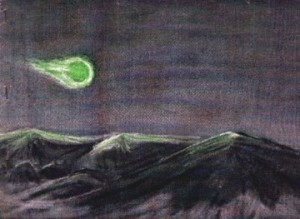 Some in the Hollow Earth community speculated that sinister forces caused his death to prevent further excursions into their subterrainian world. Are there really races of extraterrestrial beings living beneath our very feet? Is this where Sasquatch and other cryptids come from ? Are these the ramblings of very creative or disturbed minds? I personally would need a lot more information and evidence to entertain such thoughts, but as always…. you be the judge. Alien abduction is a phenomenon that for decades has struck fear and curiosity in scientists, enthusiasts, and even officials and U.S. congressmen. March 20 saw the passing of the annual Alien Abduction Day, which will likely usher in a new season of UFO festivals and conferences where like-minded individuals will gather to compare notes on the phenomenon. But that begs the question: Are alien abductions really happening across the world? The most likely answer is yes or, rather, that the abductee is telling the truth and believes what he or she is saying. 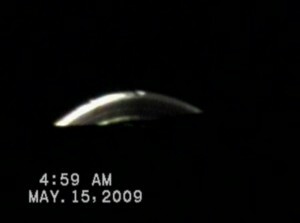 Although it is impossible to verify every claim of alien abduction, the great majority of cases involves a certain level of psychological trauma indicating that even if the people weren’t abducted by aliens, they definitely experienced something and that the experiences weren’t the product of over active imaginations. Even though it’s difficult to disprove what these people are saying, mainstream scientific and academic circles tend to look for earthly explanations in these cases. 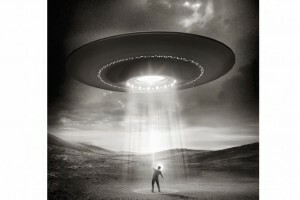 In the Psychology Inquiry article “Not Just Another False Memory: Further Thoughts on the UFO Abduction Phenomenon,” the authors worked with the hypothesis that the alien abduction phenomenon is the product of a masochistic mind and is an expression of the individual to either, consciously or subconsciously, seek an escape from the self. However, other researchers, including Harvard Medical School professor of psychology John E. Mack was a proponent of the alien abduction theory and claimed that these people’s experiences were real. 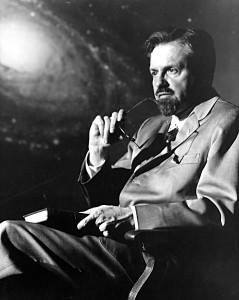 He believed that the majority were indeed abducted by extraterrestrials and subjected to a variety of traumatic and horrible experimentations, according to the John E. Mack Institute. The phenomenon cannot be understood within the realm of traditional science, Mack believed. His work attracted the attention of hundreds of alleged abductees who saw him as a person they could turn to and not fear ridicule. 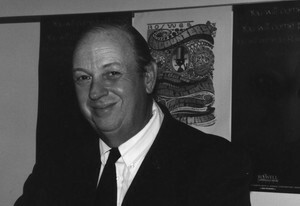 Mack, who died in 2004, won a Pulitzer Prize in 1977 for his work “A Prince of Our Disorder,” about T.E. Lawrence, also known as Lawrence of Arabia. The first widely acknowledged alien abduction story was of Betty and Barney Hill. The first widely acknowledged alien abduction story was of Betty and Barney Hill, an American couple. They claimed to have had an abduction experience on a rural road in New Hampshire in 1961. Although the couple had no immediate memories of the alleged encounter, Betty reported having vivid, horrible nightmares about being aboard an alien craft with her husband and having to undergo examination. Boston psychiatrist Dr. Benjamin Simon conducted the hypnotic sessions with the couple, which revealed a more detailed encounter with aliens, including their abduction, examination, and even a brief conversation Betty had with one of the aliens. 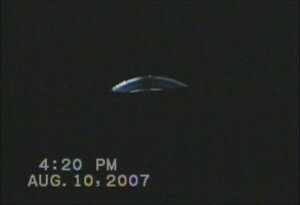 Simon’s conclusions, according to UFO Evidence, were that the couple was not lying but that the experience was a result of Betty subconsciously filling the details of their amnesia with an alien abduction scenario and that Barney subconsciously absorbed Betty’s details of the encounter and reflected those in his separate hypnosis session. Walton’s account describes Nov. 5, 1975, when he and six others were clearing trees in the Apache-Sitgreaves National Forest in Arizona. As the crew was wrapping up its work for the day, a light came through the trees and a flying saucer appeared. As Travis curiously approached the craft, he was injured by a beam of energy from it. The other men drove away frantically, having witnessed the encounter and believing something similar would soon befall them. Missing for five days, Walton recounted his experience of being surrounded by three small humanoid creatures with unusually large brown eyes whose pupils covered the whole eye. In retrospect, he believes the encounter was not premeditated. The craft may have been trying to flee the forest scene, but Travis was injured by energy emitted from the craft’s propulsion and the aliens may have felt obligated to take care of him. However, his experience was both physically painful and emotionally traumatic. To validate his story Travis took a polygraph test shortly after his return and continues to take polygraph tests as the technology has improved over the decades. He has passed them all, according to Walton’s Open Minds Interview. But Where Is the Physical Evidence? If alien abduction is real there must be physical evidence of some kind. In fact, many alleged abductees do claim to have scars, marks, and other physical evidence including implants in their bodies. Many “abductees” and even some who have never recalled any abduction event experience a sudden protrusion on a certain part of their body. Some of these people have x-rays showing objects lodged under their skin. Others have had them removed. One example includes Licia Davidson (37) who had a crystal-like object removed from her foot in 1997, according to MUFON (Mutual UFO Network, one of the world’s most widely recognized organizations for UFO research). Other cases include Pat Parrinellio (47) and Mary Jones (Pseudonym, 52) who had metal objects removed from the back of the left hand and left big toe, respectively. Chief investigator Derrel Sims of HUFON (Houston UFO Network) covered the cases and the samples were sent to National Institute of Discovery of Science (NIDS) at New Mexico Tech for analysis. The analysis included laser spectroscopy, metallurgical analysis, and examination under a scanning electron microscope, among other tests. No obvious signs of technology were ever documented. However, the tissue surrounding the implants (while they were in place) exhibited no inflammation, a common occurrence when foreign objects are lodged in a person’s body. Additionally, the implants seemed to be connected to nerves or surrounded by nervous tissue in all the examples. Assuming aliens are indeed abducting humans and subjecting them to emotionally and physically scarring examinations, the question of why naturally surfaces. Unfortunately, it is also the hardest to answer because we have no aliens to approach and ask. The answer may simply be curiosity. After all, some of the examinations modern scientists conduct on animals in the wild in order to better understand them could be compared to alien abductions on humans. Modern scientists tag, mark, or attach devices to easily identify the animals in their natural environment and track them as they migrate. Other theories include more malicious motives including genetic tempering, sexual encounters including hybrid production, cloning, and so on. Like the many other theories proposed by abductees and researchers, these theories bring us to more esoteric lines of thought and possible answers raise even more questions. From August through September of 1951 the US Air Force investigated one of the first great UFO cases in the United States. At 9pm on August 25th three Professors from what is now known as Texas Tech University were relaxing at one of the professors homes when a series of lights flew above them. Moving N to S at a very high rate of speed and the brightness of a star only larger in diameter they flew in a perfect almost semi circle pattern which contained approx 20 – 30 lights. Over a three week period these lights were observed by these men over 12 times. Over the course of two months over 100 people all around the Lubbock area observed and also reported seeing these strange lights. On the evening of 31 August 1951 at about 11:30PM, a college freshman named Carl Hart observed a flight pass over his home. 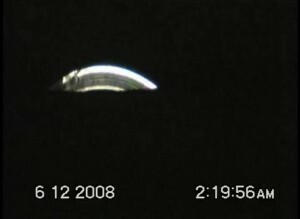 It is said two more flights of objects allegedly also occurred in which he photographed. These are now known as the famous Carl Hart Photographs. It was observed that there was no sound that could be attributed to the objects and the color of the lights was bluish green in tone. 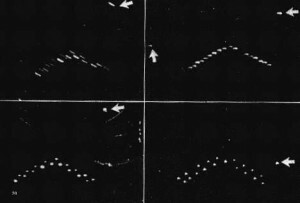 It was also stated the first two flights observed were a semi-circle of lights but in the subsequent flight there was no orderly arrangement. The objects did not gradually come into view as would an aircraft that was upon approach, and neither did it gradually disappear. It was also noted there was no apparent change in size as any of the objects passed overhead. Carl started watching the skies when word was spread about the college professors sightings in the local Lubbock Newspaper “The Avalanche”. After capturing his series of photos Carl, he took the film to a friend at a photo lab so that he could develop it. The Avalanche learned of the pictures when a photographer who did some work for the newspaper called to say that Hart had just been there developing some film. He thought Harris might be interested, and Harris suggested that Hart bring the negatives to the office. This was indeed the turning point in bringing these sightings to the forefront. Carl Hart never copyrighted his photographs in fear some may think they were a fake and the reporter at the Avalanche had accused him of hoaxing the whole incident and proceeded to tell Carl the consequences of fraud. A short time later Carl decide to send the photos out over the wire. Though many have tried to duplicate the photos at that time no one could ever debunk them. Upon learning of the photographs, the US military spent a great deal of time trying to come up with some kind of explanation. Officers came in from Reese Air Force Base as well as Wright-Patterson located in Dayton, Ohio. 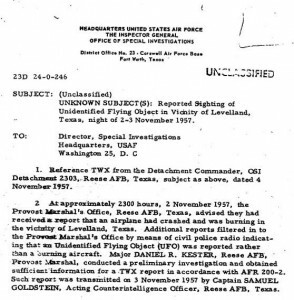 Lt. Edward J. Ruppelt even made a personal trip to Lubbock to investigate these lights and to interview Carl Hart as well as some of the others who had claimed the sightings. Ruppelt’s was not the last and only interview by the US military. On December 2 Hart was questioned again. According to the OSI report, He was interviewed in private and asked for a written statement. Evidently the military hoped to break his story, which was a continuing obstacle to a bird explanation that they had come up with, but if a professional photographer could not get a picture of birds at night (which they had tried), how had an amateur done it? The obvious answer was that Hart had not photographed birds. If so, could that mean the objects he had photographed be unidentified flying objects. The US Military’s report concludes that: birds, with street lights reflecting from them, were the probable cause of these sightings. The angular velocity of 30 degrees per second seems rather high for birds during migratory flights. It is probable that the angular velocity was less. In all instances the witnesses were located in an area where their eyes were dark-adapted, thus making the objects appear brighter. The kind of birds responsible for this sighting is not known, but it is highly probable that they were ducks or plover. Since plovers do not usually fly in formations of more than six or seven, ducks seem more probable. There are, however, no migratory birds in the Lubbock area at that time of year. According to Loren Smith of Texas Tech, ducks do fly in V -formations in the area in late August. The glossy ibis, for example, visits the area, but it has no white with which to reflect the streetlights. Therefore the bird explanation does not work. In fact, the photographs taken by Hart refute this theory, but that seemed to made no difference. And it also made no difference that a professional photographer, when he attempted to photograph a flight of ducks at night, could not do so. Project Blue Book lists the case as solved by the birds. 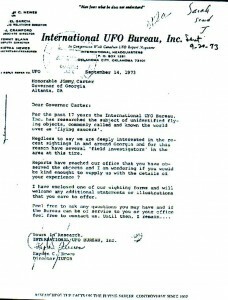 Jimmy Carter is one of two U.S. Presidents who have reported seeing a UFO before becoming the President. Carter’s UFO sighting began shortly after dark on a windless night. Jimmy Carter was standing outside the Lion’s Club in Leary, Georgia, waiting for a meeting to start. Suddenly, he and ten or more witnesses, sighted a red and green orb radiating in the western sky. 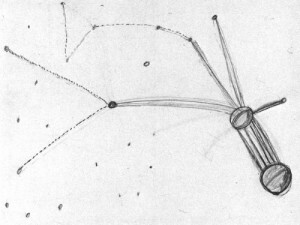 Carter described an object that “it seemed to move towards us from a distance, stop, move partially away, return, then depart. Bluish at first; then reddish – luminous – not solid.” “At times,” reported Carter, “it was as bright as the moon, and about as big as the moon – maybe a bit smaller. The object was luminous; not solid.” In an interview with the Atlanta Constitution, Carter described the moving nature of the event. He described the sighting as a “very remarkable sight.” This is an important event, because many of the skeptical investigations done on the Carter sighting, have tried to paint the event as a ho-hum occurrence. None of the descriptions Carter has made of the event have ever described it as ho-hum. Jimmy Carter’s mother Lillian also confirmed that Carter had been very impressed by what he had seen. “The UFO made a huge impression on Jimmy,” she stated. “He told me about the sighting many times. He’s always been a down-to-earth no-nonsense boy, and the sighting by him, as far as I am concerned, is as firm as money in the bank.” Carter had, in fact, described the UFO sighting many times in the years since it occurred. In every instance, including the latest known telling of the story at Emory University in 1997, Carter has never backed off on the spectacular nature of the event. He has also never conceded that was he saw was some misidentification of a natural phenomena. Carter estimated that the object was three hundred to one thousand yards away. Summary: Following is the form Jimmy Carter filed with NICAP (originally filed with IUFOB) on Sep. 18, 1973. Only the questions that were responded to are listed. Carter’s responses are in quotation marks. One of the first modern UFO and Alien mysteries happened with the crash of a UFO at Roswell New Mexico, in 1947. The Grey Alien, or E.B.E. Extraterrestrial Biological Entity, was described. They were Grey in color standing about 4ft tall with large oval heads and deep black eyes. 1961, New Hampshire. Betty and Barney Hill were a young married couple driving through the countryside one evening while returing from a vacation in Niagra Falls. They both spotted a strange light in the sky off in the distance and thought it was strange. The light got closer and began to follow them becoming eerily close and panic ensued. For unknown reasons, the next thing Betty and Barney remember was sitting in the car parked engine on in idle with several hours missing 35 miles away from where they last remembered being. Missing time has since been documented with other cases of Alien Abductions. In 1964 during a hypnosis session, Betty Hill recalled the night of the abduction during which the E.B.E.s showed her a holographic 3D image of a “star map” where the aliens are from. 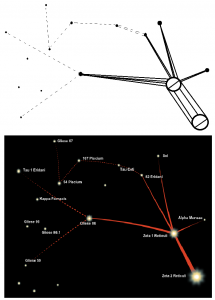 Betty then drew the map which was a binary star system with several planets and common and uncommon trade routes the aliens use in space travel. 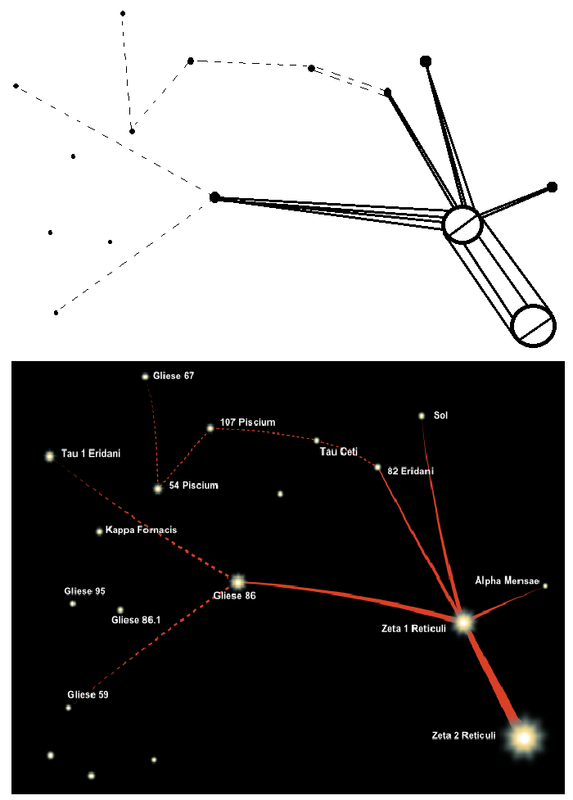 It was not until 1969 during a several year investigation by the now defunct National Investigations Committee On Aerial Phenomena “NICAP” finally located a star system that is almost an exact match to the “star map” Betty Hill drew in 1964. 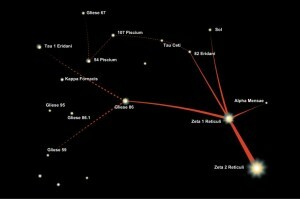 Known as the Zeta Reticuli star system, it was unkown at the time Betty Hill drew the “star map”. Ufologists now refer to the Grey Aliens as possible Zeta Reticulans and by the name they called themselves…Ebens. Also, during a hypnosis session in 1964, Barney Hill recalled more events of the evening in 1961. As the strange light got closer, it stopped and hovered a short distance away from the Hill’s car approximately 100ft away. 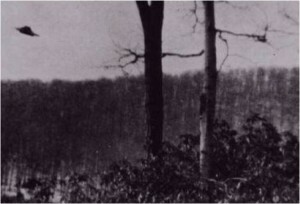 The craft Barney described was approximtely 60ft in diameter, saucer shapped with several windows. Barney claims to have seen 8 to 10 small “beings’ looking out the windows at him. Both Betty and Barney Hill recalled the classic “Alien Abduction, Examination and paralysis” that has been reported by victims over the years when they were escorted on the craft. The Grey Aliens, Zeta Reticuli, Star Map, Missing Time, Alien Abduction this case seams to have been a first in all these topics.